Join this webinar to hear how technology is creating a mobility enabled workforce to increase productivity in financial services and the lessons other sectors can learn. Creating a modern workforce that has access to the technology that will improve productivity is key to ending the productivity crisis. 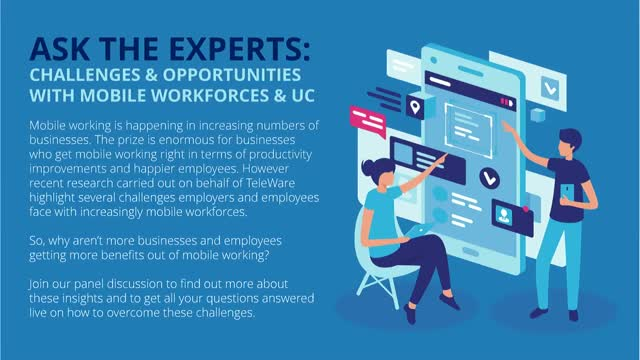 TeleWare, working with Financial Services clients are helping create a mobile enabled workforce designed to improve productivity. These lessons can be adopted in many vertical sectors, particularly in a post GDPR and Brexit world. • How are banks and other financial institutions deploying mobile recording? This thought-provoking webinar will provide insights into these and other issues and help you pinpoint the main considerations in implementing a communications recording strategy for your business. With lots of opportunities to ask our experts, you can get the answers to your burning questions. New regulations such as MiFID II mean that the regulatory requirement for recording, storage and retrieval of communication data has grown exponentially. Infrastructure and governance overheads and security must be managed wisely, utilising next generation technologies where available to ensure compliance is cost-effective, robust and meets required SLAs. Join a group of industry experts including TeleWare and Microsoft to hear more about how financial markets players are turning to the cloud to meet and surpass exacting standards in recording, storage, retrieval and governance for communications data. • Cloud services for Cap Markets - how have cloud services developed to meet the exacting standards of the investment banks and brokers? • Why now is the time for cloud services in capital markets. • Voice and eCommunication recording – why the cloud is taking the sting out of the increased data storage requirements for MiFIDII. • Compliance-specific requirements – including data security and in-country storage. • Hybrid deployment models – leveraging cloud services alongside existing enterprise environments. • Cost factors – how TCO can be significantly reduced by intelligent outsourcing, including cost of governance, security and compliance. • Reaching new heights – methods of migration, deployment and ongoing data management. • And why uncertainty about Brexit is driving the need for more flexibility to scale up or down across different geographies. With the most significant regulatory change the financial markets have ever seen nearly upon us, are you prepared for the voice recording and data storage and retrieval requirements outlined in Article 16 of the MiFID II Directive. Join our webinar to hear experts from TeleWare and BT, as well as industry practitioners share their latest views on industry readiness and cost effective options to comply. TeleWare work in collaboration with Microsoft to help our partners and their customers achieve more through better communications. This short video explains how. The clock is ticking until MiFID II is implemented. January 3rd 2018 is just over 100 days away. How confident are you that your business can comply with the new record-keeping requirements? We're working with our customers to help ensure they will meet their MiFID II recording requirements. In this webinar we will share practical advice on how you can be ready on time. Senior compliance and IT professionals in businesses impacted by MiFID II. With little over 100 days until MiFID II comes into force, investment firms, trading houses, banks and other affected businesses are deep into the research phase of their projects. Join our latest webinar for exclusive access to research carried out on behalf of TeleWare to understand how ready businesses really are. Where they see the key challenges and how best to overcome these barriers. TeleWare research initiative carried out by Censuswide asked 100 compliance and IT managers about the record keeping aspects of their projects. In this webinar, we will explore the responses and cover ways in which firms can be addressing some of the common challenges. * What aspects of ‘record keeping, trade reconstruction and surveillance’ within MiFID II are causing most concern? * What benefits will MiFID II bring to firms? Hosted by SoftwareONE with guest speakers from compliant recording and analytics specialists TeleWare, this will provide practical insight to help unlock the potential benefits that MiFID II can bring. * Is everybody going to be ready in time and what happens if not? Find out how your business can have both. Cloud technology is transforming the communications landscape faster than ever before, but it can be difficult to keep up if you’re operating in a heavily regulated industry. We will explain how your business can get to grips with the latest Microsoft Office 365 technology, whilst maintaining FCA, Dodd Frank and other regulatory and governance requirements. We will also explain how your business can save up to 60% compared to your existing voice estate, by adopting Skype for Business. Register today.